The Forget This Network function of your iPad® can resolve some of the network issues you may encounter in accessing the Internet. 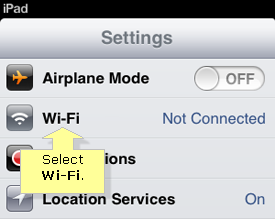 This feature removes all the settings your iPad® has set for the network you were previously connected to. On the iPad®’s Home screen, tap Settings. Tap the icon beside your wireless network’s name. NOTE: In this example, Cco-2.4 GHz is used. Tap the Forget this Network button. NOTE: Forgetting the network will cause the device to be disconnected from the network. If you need instructions on how to reconnect your iPad® to a network, click here.